3. Download firefox version for windows . (We have to wait for the native flash 9 plugin. for example both picassa and flash9 work with wine( picassa is released by google to general public to be used). Both will have native ports to linux . Well, we are talking of running Flash under a Windows version of Firefox, that in turn runs under wine. The real point here is to install Windows version of Firefox under Wine. I think it is an ingenious way of being capable of using Flash 9 under Linux, but I agree that the title of the howto is a bit misleading. In any case, thank you for your howto. Thank you very much. This was extremely helpful and I appreciate this great guide very much!! I can't help but feel dissapointment when I see howtos showing people how to cripple their Free-as-in-speech OS with freedom-restricting wares. If you've installed flash, please consider showing your support for the free software movement by uninstalling this player and finding a free alternative like gnash instead. If an alternative does not exist, then you might reevaluate how important the functionality truely is to begin with. In my case, I don't lose any sleep by missing out on this eye candy that's sprung up all over the web. True, flash is not Open Source, but I do not have to pay for it. My video drivers are not open source either. I don't think I will be giving up my drivers anytime soon. I do not use the wine, Firefox, flash combo personally, however I did have to set that up for my kids, as some of their favorite sites require the newer versions of flash. Personally I don't frequent Barney or Barbie, so I have no use for it myself. For me, the Freedom part of "Free" software is having the ability to choose what I want to run on my computer. Would I buy a video game if it were available for Linux at my local retail outlet? You bet I would! Would I pay for drivers to get my printer or graphics card to work? Heck no! Those drivers should be available for my "choice" of operating system, not someone elses idea of what I should be running. There are quite a few software titles I would be willing to purchase if they were available for Linux. Luckily I have been able to find open source alternatives for most things that are readily available to download for free. MS free since 1999, sorry uncle Billy! Agreed, but flash9 is the latest version and as i believe it, gnash hasn't come out with a v9 equivalent player as of yet, for now this is the quick, messy and dirty version. I just wanted to say that I can't help feeling disappointment when I read posts such as these. Not every user is in the same situation. While I support open-source software and very much like Linux, my six and eight year old children still very much like some of the shockwave games on the shockwave site. I asked them to reevaluate how important their game was to them, in the light of the free software movement, but they just looked at me funny and said they want to do a jigsaw puzzle online. While I may not lose any sleep directly by not being able to use Shockwave, they might, and thus indirectly I may also. I have flash 7 working natively under Linux in Firefox. Please note that Shockwave is not the same as Flash. Shockwave is not yet supported natively under Linux. This is a common error when people ask for Shockwave help, they are flamed that they can use Flash. This is inaccurate and unhelpful. There is no free alternative to Shockwave. While I do agree that this situation is freedom-restricting, my children don't care -- they just want to play their game. Until the content providers also online, and provide truly free content, then some people are going to be stuck using workarounds such as these. This is not a fault of the user, but rather of the provider. Perhaps lobbying Adobe to release a native Linux version would be more to the point. Or lobbying the websites that use Shockwave, even. But some users are going to need such things regardless of the open-source issue (like my six year old), your disappointment notwithstanding. Thank you to this poster for the helpful instructions. I'd give a 1 out of 5 to this howto. It actually explains how to use windows version of Firefox on Linux which is a really ugly thing to do. In Ubuntu, uninstall your current flash plugin first. Then you will need to make sure that you have the alien and wget utilities installed for the script below to work. Then follow the steps of this script and do it manually or copy this script and do it automatically. echo "Restart your web browser to enable the Flash plugin"
I'm trying to install Flash on Linux Mint 12, but when I open the downloaded .exe installer in WINE, it disappears as a background Linux process. I need to go into the Linux system monitor to kill the process. Any ideas? 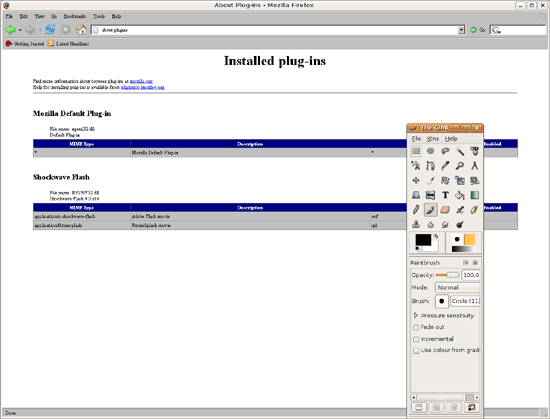 Also, the instructions mention to "point the plugins directory to c:\Program Files\Mozilla Firefox\plugins", but without instructions on how to do this?